There was a superb turn out of 42 Fairlands Valley Spartans for Thursday evening’s Handicap 5K in Stevenage. 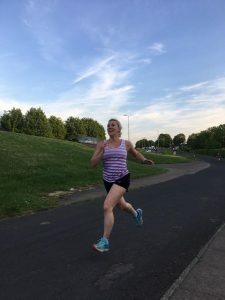 The club handicap events are a great opportunity for new runners to try a race against the clock without the need to travel and knowing there’s no danger of being off the back. First across the finish line and winner on the night was KAREN BROOM in a year best (YB) time of 30:31, 4:59 ahead of handicap, closely followed by husband TREVOR BROOM in a new personal best (PB) time of 30:36. ANDY SMITH was second man, third overall in a new PB of 22:35, while second lady (4th overall) was WENDY THARANI recording a 5k PB time of 24:03. CALLIE CHAPMAN finished third lady in fifth position with a YB time of 27:21 and new member MEGAN McROTTY was 4th lady (6th) in 26:59, ahead of 3rd man PAUL ROBERTSON (7th) who improved his PB by 37 seconds to 19:30. Fastest runner was STEFFAN FORD with 17:46, with ADRIAN BUSOLINI second quickest in a new PB time of 19:14, and PAUL ROBERTSON’s 19:30 3rd fastest. Quickest lady was CLAIRE EMMERSON in a new PB of 22:09, with YUKO GORDON second quickest in a YB time of 22:37 and WENDY THARANI third fastest with her 24:03. There was also PBs for JENNY GARRETT (24:56), ANGIE KEELING (28:39), WAYNE McMILLAN (29:43), NIKI PLUMB (33:18) and newcomers CHLOE PHILLIPS (29:19), NICOLA HATHERLY (33:18), JOHN ADAMSON (22:31) and ANNIE LOVATT (28:35). LIZ CARVELL, ADRIAN DONNELLY, KAREN PALMER, BERNADETTE MILLWOOD and SARAH SAPSTEAD all recorded season bests (SB) – best time since 1st January 2017, and there were also year best times for ZOE JACKSON, NEAL MUGGLETON, JON SYPULA, SAM SIMMONS, CRAIG BACON, TIM SABAN, ROBERT SHAW, SUE HAMER, SIMON SYPULA, CLIVE CANNON, SALLY PHILLIPS, KERSTIN WEINER and KARL SHREEVE. In handicap races runners start in order, slowest first, at times determined by their recent performances. If everyone runs to form they will all finish together, so the winner will be the best improver. 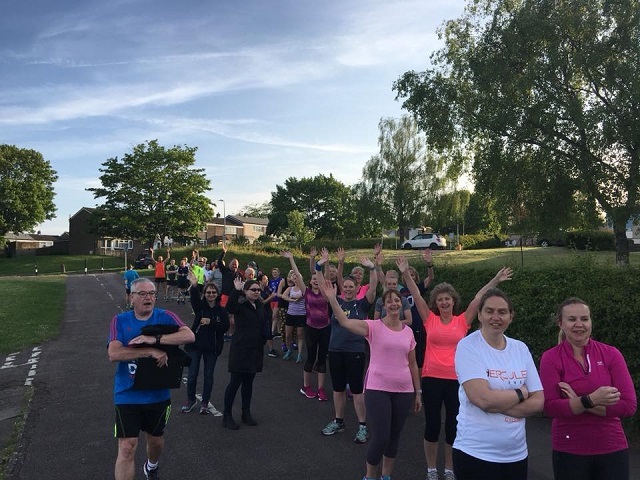 Next handicap 5k is scheduled for Thursday 5th July. ADRIAN BUSOLINI was seventh in the Buckingham Half Marathon with 1 hour 27 minutes 57 seconds. There were 378 finishers. He said “This was only the second year of the Buckingham Half Marathon, but with such faultless race day organisation you’d be hard pressed to tell. The course can best be described as peaceful; wholly on country lanes, only briefly passing through a few local villages, and featuring less than 400 runners. It’s gently undulating throughout, with fantastic marshalling, support, an incredible range of cakes at the finish, and a distinctive purple medal to boot. Both parking and facilities were good. GRANT RAMSAY took part in the 3000 metres steeplechase in Watford and finished third out of nine, in a time of 11:01. That’s only one second out from getting into the UK rankings. However the result was still a season’s best by a massive 43 seconds. ERICA GRAYSON ran the hilly Windermere Marathon in 4 hours 36 minutes 44 seconds. Jo and Rufus were second canicrosser in the Paras 10 mile race at Colchester on Sunday. JO BOWDERY ran a new personal best of 1 hour 21 minutes 30 seconds, an improvement of four minutes, and RUFUS is her dog. Jo was third female overall. They had a great day out and raised money for the paratroopers. CAROLINE CROFT was at the same event and said it was a scorcher of a day and a well organised event. She finished in 1 hour 40 minutes. Congratulations to the six Spartans that achieved Parkrun personal bests this weekend! At Stevenage, Todd GRAY was fourth male with a new Parkrun PB of 18:55, Kelly MCHALE was 10th female with PB 25:13 and Wills JENNINGS achieved a new PB of 23:18. Natalie LAWRENCE flew round the course to achieve first female placing in 18:47, she only missed the women’s record by two seconds and says she’ll be back soon. Danny SCANLON was 7th male in 19:23, Verity FISHER was 11th female in 25:38 closely followed by Claire EMMERSON 12th female in 25:42. Ciaran MCANENY and Susan MCANENY ran Derry City finishing as first male and third female in 18:19 and 25:05 respectively. John ROXBOROUGH achieved a new PB at Westmill in a time of 22:02, John was 4th male and finished narrowly ahead of Thomas SAUKA who finished 5th male in 22:10. Tim SABAN ran Bideford and finished 10th male in 19:55, and John HARRIS completed Letchworth with a new PB of 21:19. Gareth COWELL also achieved a new PB of 21:58 at Rosliston.